The nature and scientific measurement of geological and cosmological time are among the most misunderstood and difficult to teach concepts in all of K-12 science education. To address this issue, a multi-disciplinary team of geologists, astronomers and education professionals at Western Kentucky University developed a series of professional development workshops for pre- and in-service middle grades teachers. The goals of those workshops were to 1) to develop teacher's content understanding of rates of change and the ages of the earth and universe; and 2) to provide teachers with materials, activities and teaching strategies to help them more effectively educate students about rates of change and the concepts of deep time. Two four-day workshops were held, with each workshop divided into two two-day sessions. Each workshop day consisted of a blend of in-depth content discussions, hands-on activities, and classroom implementation forums. The teachers were provided with all the materials necessary to implement the lessons learned during the workshops as well as publications pertaining to deep time and evolution. Teachers were assessed prior to and immediately after each workshop day and were required to submit a classroom implementation plan as part of their involvement in the workshops. We have been successful in meeting our workshop goals. The participants clearly advanced their content understanding of geological and cosmological time and the implementation plans received clearly show a desire to apply many of the activities learned in the workshop. 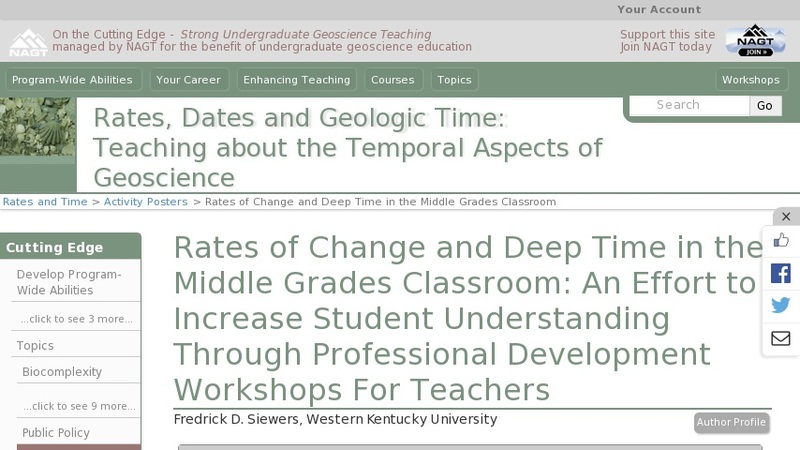 Ironically, and despite state science standards mandating coverage of concepts of rates of change and deep time, teachers find that they do not have the time to fully educate their students about geological and cosmological time. We are currently assessment results and are working to disseminate the workshop materials (http://astro.wku.edu/universe).